We've got a worldwide exclusive premiere today! The good and right Rev. 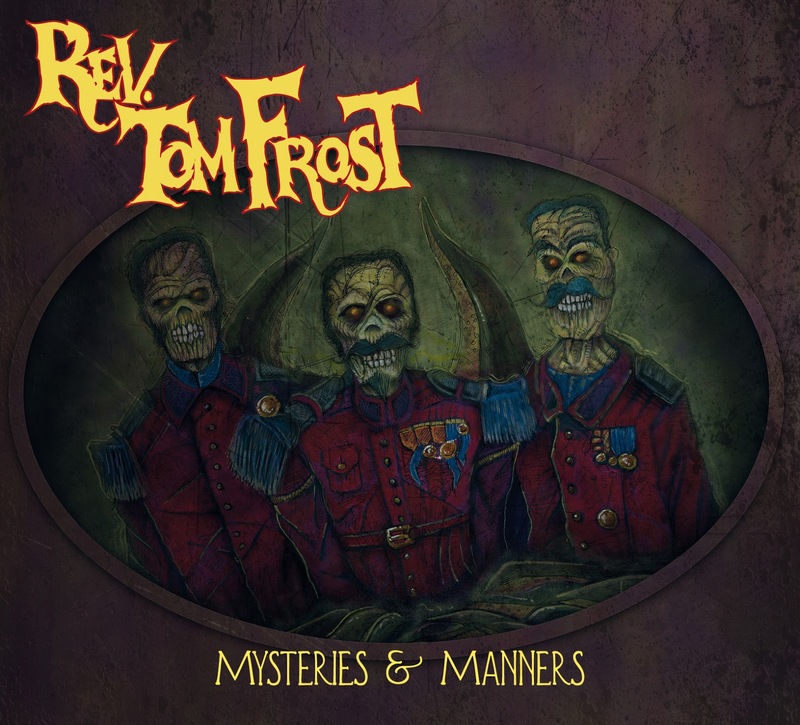 Tom Frost has been shaking chains, exorcising demons, and shaking bogeymen loose for years, and over numerous albums and projects. Each of these albums have served a carnival ride ticket into the darker corners of a world both natural and supernatural, stomping affairs filled with western noir, exploitation sleaze, Waitsian holler, riddim'n'booze, and sanctified holy roller baptism. He's about to release his best rekkid yet. Mysteries and Manners (due September 30) is a killer, ghosted, fright-fest, full of tribal rhythm, hoodoo voodoo, and dirty deeds done in stormy dark nights. Kicking off with Dorsey Burnette's Tall Oak Trees, with its resonator geetar and phlegm soaked guttural vocal, the lyric (And then along came the devil/Up out of the ground/He tempted the woman/And that spread sin all around) sets the stage and Frost hollers maniacally over the top, surging the trope and claiming it into a throbbing revival meeting. Things spiral even further into Dante's purgatorio from there: The Dark Road bashes into a frenzy; Thunder and I rides a harmonica groove into Route 666, pickup truck spinning on brimstone road; Trashcan slings a greasy blues workout blessed by Santa Muerte; Golden Days, Red Hot Night sears mariachi seared into the very flames of hell. Frost's take on Hey Brother, Pour the Wine, most famously done by his lordship, Sir Dean Martin, visits a mafioso party turned sangria bloody, and Frankie Laine's That Lucky Old Sun is a barrelhouse rollicker, rollin' 'round heaven all day. Rev. Frost plays almost all the instruments on this rekkid, ably assisted by Dr. Fredaz on Sax and Trumpet. His voice is a crunched gravel Pentecostal preacher, testifyin' in tongues and lust, salvation and sleaze, full of stomping, sin-fueled rave-up, soul sold twistin' hallelujah, hay-baled scuzz, Satan-blessed nightmare, you wake in a terror sweat, fumbling for the dial, radio tuned into crackly transmission from the blessed damned, all-night DJ spinning the soundtrack for the end of days, the jukejoint full of skeletons rattling sacred bones into dust, the pork pie pianist with burning fingers laughing in flames, unchained ghosts dancing about the shimmy wobble, sing Glory! Glory! The rekkid, Mysteries and Manners, comes out September 30th. One of thee very best records of the year! For more info, and to pre-order, go here. Looking forward. Always loved his Bloody Halloween mixes. Collect all 17(?)!!! Michelle! Slow down. I have a stress fracture.